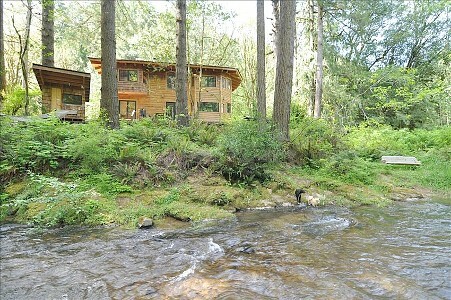 Relax and revive in this artistic "cabin" with wonderful views of historic Glenn Creek from every room. Summer rate = $275(June-September 15th). Refundable $300 security deposit. Staying 2 nights or less = $30 cleaning fee per night. An architectural dream, you enter this lodge style home through a pivoting hobbit style front door with hardware from the 1800's. 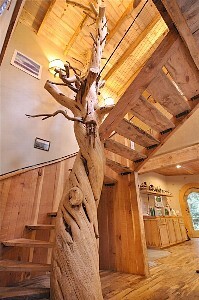 Highlights of this original home include a gourmet kitchen with labradorite granite counters, 800 year old juniper tree spiral stair case, huge beams and exposed rafters, a sauna, and a romantic wood stove. 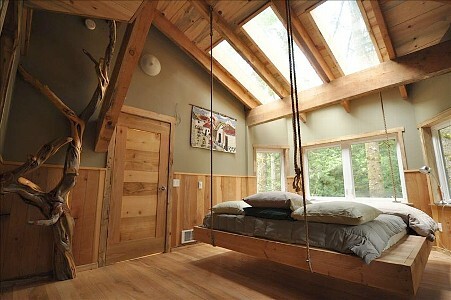 Also each upstairs bedroom has a hanging bed with three 8 foot skylights above for indoor star gazing. 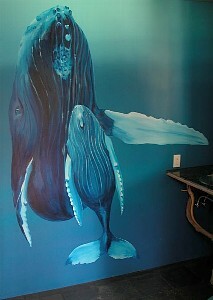 Original artworks from local artists are throughout the home. Many pleasantries await the curious such as embedded fossils in the cracked mud walls. 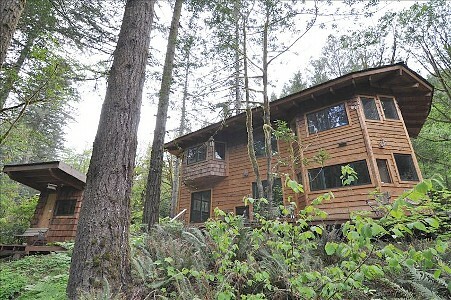 Nestled amongst towering fir and cedar trees, with windows everywhere, you'll feel and see nature's presence. This home site has a remarkably peaceful way about it. 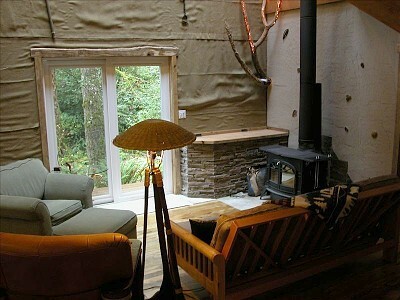 You really can sit on the couch by the fire, listen to the creek and watch the salmon and steelhead spawn (November-March). You won't even have to venture outside to get wood for the fire, just use the indoor wood box. With much less wind, temperatures are usually 15 degrees warmer than on the beach or in Coos Bay and the famous coastal fog won't bother you here. 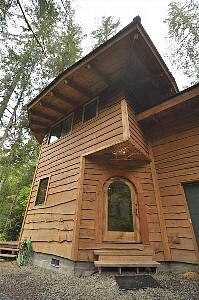 Recently featured in KCBY 11 TV's ~In Focus~ "Goin' Green" and Oregon's Solar Home Tour, this is a unique "green" home. 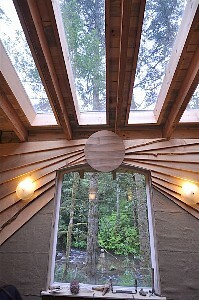 This home was built with environmentally friendly materials. Building with little impact on the surroundings was very important to us during construction. The myrtle hardwood floor in the kitchen and living room was milled on site which came from trees that stood where the house is now. 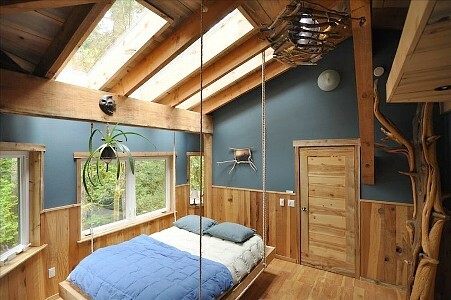 Same story for the beautiful maple flooring in the ½ bath. 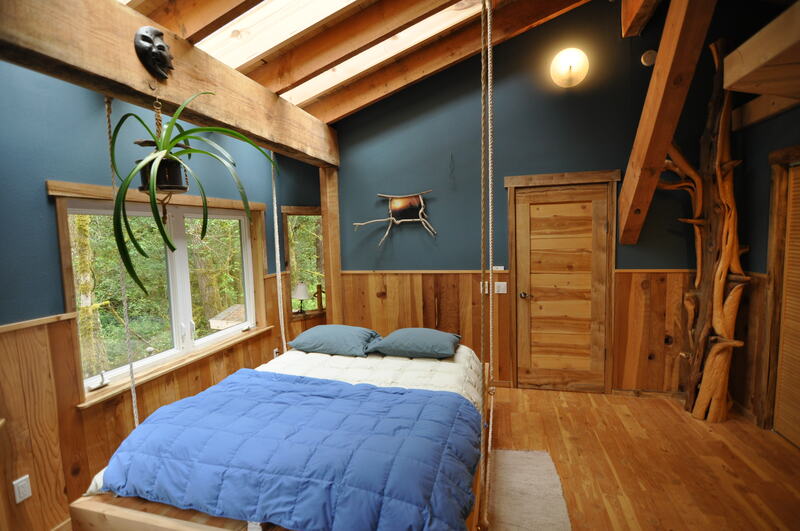 All of the large beams and fir flooring came from two 4' thick 104 year old douglas fir trees which also stood and were milled where the house is now. The fir trees sprouted after the last forest fire that came through the canyon. One of our neighbors fell a sixty five year old redwood that was over six feet thick! We used some of it as a wonderful wainscot paneling throughout the house. All of the finishes used are no or low VOC. Surrounding the house is native vegetation, huge trees and a few herbs and spices for cooking. You'll enjoy the fully equipped kitchen with labradorite granite counters. The kitchen island has a new five burner gas stove with a convection oven and warming oven. 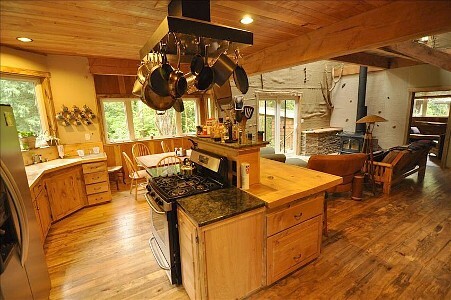 The island has plenty of granite and wood counter space. Hanging from the exhaust hood are stainless, non-stick, and cast iron cookware. Also included are coffee and a grinder, coffee maker, toaster, microwave, utensils, chef knives, glasses and frosty cocktail glasses in the freezer. The dining room table has a river view and can seat eight. There is also seating for three at the island bar. From the kitchen you can visit with the folks in the living room thanks to the open floor plan. Beside the wood stove are two chairs and the futon couch with reading lamp. A CD changer and TV with a DVD player and VHS machine are in the downstairs bedroom. Bring your favorite videos or browse our selection of movies. We accept all credit/debit cards through PayPal, cash, and check. 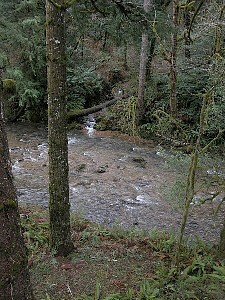 Just upstream is a private swimming hole with a water fall. Perfect spot for family reunion!! Shane - Just got back from our week long excursion to BTF Lodge and can't say enough about our time there. It was absolutely PERFECT and everyone thoroughly enjoyed themselves. I live in CB and it was like being in another world ... the rest of the family - from Florida, Georgia and North Dakota - were thrilled to spend time there and they all said it was well worth the long trip(s) to get here. I hope we can all enjoy it again even if it's just some of us 'coasties' getting together for a quiet ... weekend. We'll be in touch and hope it's still available for rent. Thank you so much for sharing your awesome home. It is fantastic!